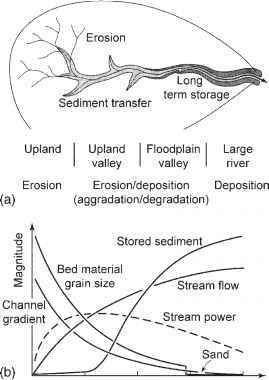 Many of the important features of inorganic substrate were described previously from the perspective of fluvial geomorphology (Section 3 31), where the emphasis was on the interaction of sediment supply and flow on particle transport and channel form. Relevant tools and concepts include the size categories of inorganic particles (Table 31) and their quantification using pebble counts to determine the median (D50) and range (D16 and D84); the relationship between particle size eroded and current velocity (Figure 3 8); and the development of channel features including riffles, pools, point bars, and undercut banks, which strictly speaking are not substrate types but mesoscale physical features often referred to as habitat units. Surface substrate usually is coarser than subsurface substrate and at least partially protects this finer material from transport, resulting in vertical heterogeneity. The stability of the substrate depends on the magnitude and frequency of hydrological events and particle size. (Minshall 1984), and the permeability of the subsurface region (known as the hyporheos) adds a vertical dimension to available habitat by allowing water to circulate and transport gases, nutrients, and fine organic material. Texture and the availability of crevices also can influence a particle's suitability as habitat. Low levels of siltation may be beneficial, particularly for species adapted to consuming silt for its organic content, but high silt levels usually have a negative influence on habitat for surface-dwelling organisms by reducing habitat heterogeneity, filling interstitial spaces, and coating consumers and their food resources. In the upper River Rhone, for example, the amount of interstitial space (defined by porosity) in the subsurface zone was negatively related to percentage of fine sediment (Gayraud and Philippe 2001). Invertebrate density was significantly and positively related to the amount of interstitial space, particularly for taxa of intermediate body size (5-10 mm), intermediate body flexibility, and flattened or streamlined shape. and at times reached nearly 6000/10 cm2. The psammophilous fauna includes some macroin-vertebrates as well, and can exhibit distinctive adaptations, often associated with respiration. The dragonfly nymph Lestinogomphus africa-nus, found burrowing deep in sandy-bottom pools in India, has elongated respiratory siphons that reach above the sand surface (Hora 1928). Several mayflies, including Dolania in the southeastern United States, have dense hairs that apparently serve to keep their bodies free of sand (Hynes 1970). Burrowing taxa can be quite specific in the particle size of substrate they inhabit. The mayflies Ephemera danica and E. simulans burrow effectively in gravel. Hexagenia limbata cannot, but does well in fine sediments. Substrates composed of finer sediments generally are low in oxygen, and H. limbata meets this challenge by beating its gills to create a current through its U-shaped burrows (Eriksen 1964).